At about 2 p.m., the three Stockton residents entered the Bank of the West. When police arrived, the robbers, with ammunition taped to their bodies, were leaving the bank with three hostages held at gunpoint. The robbers then fled with the hostages in a stolen SUV. During the hour and a half chase that reached Lodi and Acampo, robbers threw two of the hostages, both bank employees, from the vehicle. One suffered a gunshot wound while the other was grazed by a bullet. 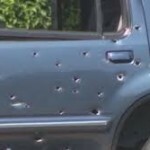 Homes and at least 14 patrol cars were hit with bullets. After officers disabled the SUV, robbers and police continued to exchange gunfire. When the shootout ended, the third hostage, a bank customer, was found dead in the SUV. One of the robbers died at the scene and a second died later at a hospital. Police arrested the surviving bank robber, 19-year-old Jaime Ramos. I heard a good point on the radio today….I am very interested in knowing who these weapons came into the hands of these gang members? Certainly they did not buy them in state as they are banned. I wonder if they are possibly tax payer purchased Fast and Furious guns of the 4000 allowed to leave by Holder and Obama? No one has lost their job or been prosecuted for this terrible crime of gun running, with the specific intent to create gun violence and therefore shift opinion to clamor for gun control. Holder and Obama need to be accountable for their illegal actions and I demand to know the source of these specific weapons! These men were Norteno gang members. “Jaime Ramos of Stockton was booked into the San Joaquin County Jail on suspicion of homicide, kidnapping, robbery and attempted murder. Police said he was one of three documented Norteno gang members who took part in an hour-long chase and shootout with dozens of officers Wednesday.” SFGate. Some newspapers simply do not report all the news, therefore, we don’t know the extent of gang violence in California and we can’t tell if it’s getting better or worse. This is an incredibly tragic event.This young mother didn’t deserve to have her innocent life taken.When is the violence ever going to stop? Illegal immigration is NOT a problem. However anonymous trolling IS a problem. Spoken by an anonymous poster…hypocrite. Hilarious how when someone makes a controversial, but good point, someone else calls them a troll. Wrong Perspicacious, you are the one bringing up “Illegal immigration” “nra” one liners on a Bank robbery article. Also I said you were trolling, not that you were a troll. Have you been to Stockton? These incidents are daily occurrences and worst. They have a no win situation with their massive crime wave, City insolvency and bankruptcy, and corruption. Gangs are running this city. Their murder rate is one of the highest (if not the highest) in the U.S. Don’t know why anyone would live their! I wonder which side shot the hostages, particularly the one that was found deceased in the bullet riddled vehicle? No doubt there will be a lot more to this story. I know that if one of those hostages was my loved one, I would be looking for some answers right now. I know we can’t allow robbers to get away just because they have hostages, otherwise robbers will always take hostages but couldn’t they have been followed by helicopter rather than a car chase especially after the perps opened fire and started throwing hostages out onto the freeway? If a LE officer shoot at the criminal but hit the hostage, the criminal is held responsible for the hostage’s death.